Silvus Technologies MIMO radios allow EOD technicians to operate high throughput hungry systems like never before thought possible. Advanced wireless capabilities have not been available to bomb squads, who have had to rely on a tethered approach, until now. With Silvus’ cutting edge MIMO radios, EOD UGV operators can now wirelessly examine suspicious objects with 3D HD video and haptic feedback precision from safe NLOS distances of a few hundred meters. 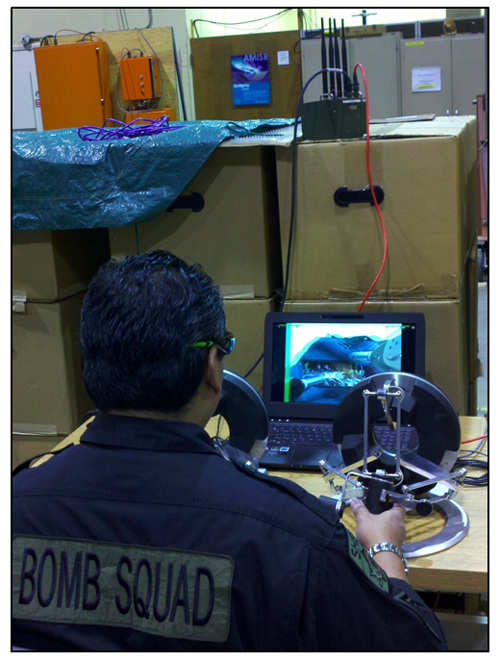 SRI International developed the Taurus dexterous tele-manipulation robot for bomb squad technicians to remotely engage with improvised explosive devices (IED). It enables surgical-like precision in a small frame that is attached to existing UGVs. The Taurus consists of 2 independently controlled ‘7 Degree of Freedom’ (DOF) arms and 3D HD stereoscopic cameras requiring over 16 Mbps of throughput, low latency and high frequency stability. It delivers hi-def 3D images and haptic feedback to a bomb disposal technician from a safe Non Line of Sight (NLOS) distance of a few hundred meters. “The Silvus MIMO radio is the only radio we found that will allow us to operate the Taurus and provide the EOD operator the ability to effectively utilize the system at a safe NLOS standoff distance. We tried other communications systems and they simply did not work.” - Tom Low, Director, SRI International. Existing UGV systems that use unidirectional COFDM based technologies can require up to 2 radios to deliver video and Command and Control data. With the addition of further capabilities, the radio requirements can even increase to 3 radios to operate a single UGV. The Silvus SC3500 IP radio is a high throughput full duplex solution that allows multiple streams in either direction to be carried by the same radio. The result is a more compact and cost effective solution. Founded in 2004, Silvus is an innovative company focused on advanced cost effective multi-antenna "MIMO" radio solutions for the commercial and military markets. Silvus is also a leader in carrying out state of the art R&D for next generation wireless communications. Silvus is at the forefront of delivering MIMO based solutions to the military and first responder communities. Silvus has been the sole performer on the multimillion, multi-year Defense Advanced Research Projects Agency's Mobile Networked MIMO (MNM) program. Other government sponsored work has focused on specific applications of MIMO technology to robotic systems, air to ground applications and wireless video. Silvus holds the distinction of being the only communications company working under the JGRE-RTC (Robotics Technology Consortium) program to deliver improved radio links for telerobotic EOD missions.